And, just like that, without warning... I post! I've been meaning to post for weeks and weeks! Life and fatigue keep getting in the way. I just had to take a minute to break the ice here. Lots of things have changed around the old homestead in the last year. I bake a lot lately, and not just for me and mine, but for others too. 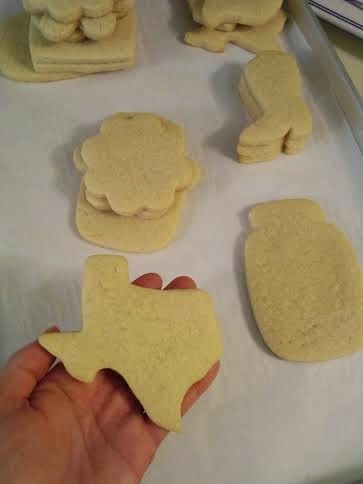 I've taken Texas up on their passage of a cottage food law in 2011 and I run a small baking business from home. Cakes are cool, but my true love is decorating cookies. In fact, it's fair and right to say that I'm completely addicted to it. These cookies will be decorated and sent to a homesick family member in New York. I hope to cheer them up! And, yes, you will see the "after" pic when I get them all good and pretty.